Iphikrates, the famous 4th century BC Athenian general, is credited in two ancient sources, Diodoros and Nepos, with military reforms that have long been the subject of scholarly debate. After he returned from service in the armies of the Persian king, in 374 BC, he is credited with reforming the equipment of his hoplites, doing away with the large hoplite shield, the aspis, and replacing it with the smaller pelta, lengthening the sword and the spear, the latter by 50% according to Diodoros, 100% according to Nepos. "For example, he changed the arms of the infantry. While before he became commander they used very large shields (maximus clipeis), short spears (brevibus hastis) and little swords (minutis gladius), he on the contrary exchanged peltae for the round ones (peltam pro parma fecit), for which reason the infantry have since been called peltasts, in order that the soldiers might move and charge more easily when less burdened. He doubled the length of the spear and increased that of the swords; he changed the character of their armour (loricarum), giving them linen in place of bronze or chain armour (pro sertis atquae linteas dedit). In that way he made the soldiers more active; for while he diminished the weight of their armour, he contrived to protect their bodies equally well without overloading them". In fact Nepos and Diodoros make it clear that the troops given the new equipment were hoplites, not peltasts, and it would probably be better to refer to these troops not as modern commentators tend to do, as 'Iphikratean peltats' but rather as 'Iphikratean hoplites'. With a long spear rather than javelins they would lack the equipment to fight in the traditional peltast manner, but would be able to fight as a hoplite, a spearman in a phalanx, albeit one with lighter equipment; the longer spear would be partial compensation for the weakening of their defensive equipment. One reason people have continually referred to Iphikrates' troops as 'peltasts' like Diodoros does is that there is plenty of evidence that hoplites continued to be equipped in the traditional manner, both during Iphikrates' lifetime and long after, right until the demise of the Greek polities as independent states. Accordingly, it is normally assumed that Diodoros and Nepos are both mistaken in stating it was hoplites that were reequipped, despite their accounts seeming to derive from two different original sources (the difference in details such as the length of the weapons would indicate that their accounts do not derive from a common intermediate source, but are independent). I would contend that the hoplites Nepos and Diodoros refer to are the Athenian marines. On ship-board is the one place where for hoplites a solid phalanx formation comprised of overlapping shields is inappropriate; a lighter shield would serve better. Furthermore, decked warships were equipped with a balustrade which protected the lower legs of anyone standing on deck, rendering greaves largely superfluous.8 The advantages of having a long spear for marine service are obvious,9 and Homer had his Achaian heroes use extremely long boarding pikes when defending their vessels, so providing a precedent that every Greek knew about. This would account for why we see no evidence that hoplites in general were reequipped in the Iphikratean manner, yet how it could be recorded that hoplites were the subjects of this reformation: if only the marines were reformed, the vast majority of hoplites would have been totally unaffected. Such a reform might not be considered very important in the greater scheme of things, the marines were never very numerous, so why then is its implementation detailed in two separate sources? I believe that Iphikrates, having experimented with his new marines, concluded that the equipment was useful on land as well. Iphikrates successfully campaigned with his fleet both in Korkyra, picking up a contingent of peltasts there, and also on the mainland nearby in Akarnania, a campaign that lasted some three years.10 Having decided the equipment was serviceable he then extended it to his mercenary peltasts. To convert a normal Greek peltast into an 'Iphikratean hoplite' would merely require the replacement of the peltast's javelins with a long spear, since they already had a pelta, and lacked greaves or other (heavy) body armour. This would explain Diodoros' passage that "actual use of these arms confirmed the initial test". A limited test (by his marines) followed by more widespread usage (by his peltasts). The source of inspiration for such equipment is not too difficult to devine. Aside from the consideration of Homer, a minority of Thracian peltasts are known to have used spears rather than javelins, including some specifically long spears,11 and Iphikrates, who is known to have campaigned extensively in Thrace prior to his reforms, is extremely unlikely to have been ignorant of the practice.12 Iphikrates is likely to have had Thracian practices in mind when embarking on his reforms. However, the catalyst that sparked his reforms seems to have been Egyptian rather then Thracian. The Egyptians with whom Iphikrates had been fighting against used spears of unusual length.13. In particular, their marines apparently made use of such weapons. Herodotos (7.89.3) records the Egyptian marines of his day in the following manner: "They wore woven helmets and carried convex shields with broad rims, and spears for sea-fighting (dorata te naumacha), and great poleaxes. Most of them wore corselets and carried long swords (machairas de megalas)". The parallels with Iphikrates' new-style troops are plain to see, such as carrying longer weapons than normal, as befits service at sea, but the differences are just as intruiging - such as the substantial shields. It seems that Iphikrates was more convinced that light equipment, such as the Thracians used was the way forward. Not too light however: although his men carried a light pelta, but it was not the traditional wicker crescent-shaped shield illustrated in so many Greek vases, rather it was apparently oval in shape ('symmetrous' meaning symmetrical seemingly in contrast to both crescent-shaped and round shields). Perhaps Iphikrates felt that the Thracian pelta was insufficient for the rigours hand to hand combat, but that Egyptian shields no less of a burden than Argive ones on board a ship. The pole-axe was also not adopted. If Iphikrates was already looking forward to expanding his marines' new equipment to other men so as to form a new type of phalanx on land (such as other Greeks and Egyptians fought in), such a weapon would have been inappropriate. Poverty was responsible for the rising number of mercenaries looking for a living both in Greece and abroad. Originally, as in Xenophon's 10000, most were hoplites, and even fewer of these men could have afforded the expensive thorax than their citizen militia equivalents. However, peltasts, with their somewhat cheaper equipment, increasingly became the standard mercenary troop. The employment of such men inevitably led to the citizen armies being used less frequently, particularly by Athens, which had the financial resources to hire relatively large numbers of mercenaries. With lack of use, the efficiency of the citizen forces inevitably declined. Demosthenes in a well-known speech says how Philip II of Macedon's professional army was able to campaign throughout the year,15 and it was the Athenian troops' rash inexperience that led directly to their defeat at Chaironeia in 338 BC. A far cry from the heyday of the Athenian empire, when in the 450s BC, Athens was simultaneously able to maintain two campaigns in Greece, while another large army was serving abroad in Cyprus and Egypt, comprised of citizen troops that could fight overseas for years on end. If Iphikrates did convert his peltasts to 'hoplites', the practice may have rapidly spread amongst Greek mercenaries if it proved successful under such a famous commander, and indeed, Diodoros states "the success of the experiment won great fame for the inventive genius of the general". It is interesting that while Iphikrates' campaign in Korkyra and Akarnania is praised by Xenophon, his next campaign in 369 BC, when he commanded the full Athenian citizen army, is denigrated. The troops argued with their general, and the expedition proved a fiasco.16 Iphikrates may have been less than impressed with the Athenian citizen troops he led on this occasion. He famously compared an army to a body, with the general as its head, directing the movements of its limbs. Citizen soldiers that complained and disagreed with his decisions had no place in his corporate scheme of things. Yet he had seen that even as he led them to victory, battles could not be won by peltasts alone. His age saw its fair share of pitched battles, battles where the clash of the hoplites was the central issue. Battles could be tipped by the intelligent use of cavalry and light troops, but positive victory required the invlovement of the heavy infantry, of hoplites. A general who did not want to burden himself with citizen levies, yet wanted to be able to fight field battles required another source of hoplites, and Iphikrates solved this problem by rearming his peltasts once his experiment with his marines had proved a success. If the vast majority of Iphikratean 'peltasts' as recorded by Diodoros were actually originally peltasts, this might provide an alternative explanation of why Diodoros calls them peltasts despite using equipment that would normally be described as a hoplite's. Perhaps Diodoros had one source (the one that Nepos also used?) that said hoplites were (initially) converted, and another that (later) they were peltasts. It would be only natural for him to assume that his hoplites would then be called peltasts because they each had a pelta.17 However, it may be that originally they really were called hoplites, and that their name was changed sometime afterwards. Certainly Xenophon refers to Iphikrates' men after he manned his expedition to Korkyr as both hoplites and peltasts. Diodoros records (16.24.2) that the Phokian general Philomelos, in 355 BC, at the start of the so-called Sacred war, "hired foreign mercenaries and picked a thousand of the Phocians, whom he called peltasts (eplixe chilious, hous onomase peltastas)". This is an interesting choice of words. If they were genuine peltatss, why not just say "a thousand Phokian peltasts"; if they were normal hoplites, why not "a thousand Phokian hoplites"? Why were they "called" (the word might also be translated as described, named, or addressed as) peltasts? It seems that here we may have the man responsible for renaming the Iphikratean hoplite a peltast. The demise of the "peltast"? However, the striking thing about the Greek histories recording the second half of the 4th century, an age well documented due to the activities of Alexander and his successors, is the almost complete absence of references to peltasts. Demosthenes for instance refers to Philip having hoplites and mercenaries etc., but not hoplites and peltasts. In all of Arrian and Diodoros' long accounts of Alexander's campaigns, although mercenaries are often mentioned, there is not a single reference to peltasts forming part of his army. One of the last references to peltasts in the 4th century BC comes from Xenophon (Hellenica 6.1.9) referring to akontistai (javelinmen) and peltasts as synonymous. Although the time referred to is 374 BC, the passage was probably written in the 350s (Polyainos also refers to peltasts in the 350s in a passage dealing with the Theban Pammanes). What then had become of the troop type that was so ubiquitous in the earlier part of the century? It has been customary to simply equate mercenaries in Alexander's day with (traditional style) peltasts . However this then just begs the question of why are Alexander's mercenaries never recorded as fighting as skirmishers? Alexander used archers and (non-Greek) javelinmen for this purpose, especially the Agrianians provided by his close friend King Langarus. In the open plains of Asia, javelin-armed skirmishers were ill suited to countering the Persian's most reliable military asset: their cavalry. In contrast, an Iphikratid-style 'peltast' with a long spear would be as effective as any other hoplite in warding off cavalry: the long experience of constant Greek and Persian confrontation had demonstrated the steadfastness of Greek hoplites in the face of mounted troops. As Alexander had ready access to non-Greek skirmishers, he had no need of traditional Greek peltasts. If the term mercenary had by Alexander's day become synonymous with peltast as understood by Xenophon and Thukydides, we would expect to hear of Alexander using his mercenaries in a skirmishing role, even if only on a single occasion. But we don't. The conclusion is to me inescapable: Alexander's Greek mercenaries were not such traditional peltasts. Instead he employed, in great numbers, the equally cheap Iphikratid-style hoplite which meant he had all the more men capable of standing up to his mounted Persian opponents. One reason to discount large numbers of Alexander's Greek mercenaries being hoplites is Alexander's reluctance to use them in front line roles in battle. It is true that Alexander's historians focus on his activities to the exclusion of generals like Parmanio who often undertook side campaigns on their own, and that mercenaries often constituted a good proportion of the troops involved in such side expeditions. However, it is obvious from looking at the nature of Alexander's own such side expeditions that the nature of the fighting involved was often markedly different from that expected in a pitched battle; and even then there was usually a nucleus of Macedonian troops around which such expeditions under Parmenio, Krateros, etc. were formed, who were no doubt expected to bear the brunt of the fighting. I have no doubt that if Alexander had sufficient numbers of such troops in his army he would have used them in an aggressive manner. Instead he used his mercenaries in the rear line.21 As Iphikratean hoplites, their long spears meant they could easily hold off Persian cavalry; had they been in the front line they would be very vulnerable to the other troop type the Persians disposed large numbers of: archers and other missile-men. Traditional hoplites had large shields covering their bodies, and greaves to protect their legs. Alexander's phalangites had smaller shields, but unlike Philip's orginal phalangites had acquired body armour, the thorax, in compensation,22 and additionally derived some protection from the forest of pikes sloping over their heads.23 Iphikratean hoplites would have none of these defensive benefits, and so could be expected to take heavy casualties from archery if they were to be positioned in the front line; being in the second line, their most likely opponents would be cavalry outflanking the main formation, as happened at Gaugamela. Alexander's tactical dispositions are entirely sensible if these considerations are taken into account; it is hard to reconcile them if most of his Greek mercenaries were either traditional hoplites or traditional peltasts. It is often remarked how similar the equipment of an Iphikratean hoplite is to that of a Macedonian phalangite.24 Philip is credited with inventing the equipment as well as the order of the Macedonian phalanx in or soon after 359 BC, which should probably be taken as a reference to the invention of sarissa (pike), since the other items of equipment said to be carried by Phlilips' men by Polyainos, helmets, greaves and shield, were clearly already in existence, even in Macedonia.25 The spear of a hoplite is usually reckoned as being somewhat under 6 cubits long, about 8 feet. By Diodoros' account, the Iphikratean spear would thus be 8 cubits long, or 12 feet, and hence still shorter than a Macedonian sarissa which had a minimum length of 10 cubits, 15 feet, and was normally 12 cubits or 18 feet long, although later Hellenistic phalanxes apparently used pikes 14 cubits long.26 By Nepos' somewhat less reliable account, the spear would be about 16 feet long which would put it in the sarissa range, although it is hard to see how such a weapon would be wielded one handed, and if it was wielded two handed, Iphikrates would be the inventor of the phalangite, not Philip. It is more likely Nepos' source considered that a normal hoplite's spear was less than 8' long and indeed many artistic depictions show hoplite spears 7 foot long or even slightly less, which would put the Iphikratid spear at under 14 feet long. It is widely appreciated that Philip is likely to have picked up many of his tactical ideas from living for a time in the house of Pammanes, close friend of that great tactical innovator, the Theban general Epameinondas. It is not generally appreciated however that Philip was even more closely related to Iphikrates, who was Philip's own brother by the adoption carried out by Philip's father Amyntas.27 Philip could not but help but have been aware of Iphikrates' reforms. The Macedonian army before Philip's time relied on its aristocratic cavalry. It included a few hoplites, but the majority of the men were essentially an ill-armed and untrained rabble.28 Thukydides implies that the infantry situation improved somewhat just before the start of the 4th century, but it is evident from the number of times the Thracians and especially the Illyrians overran the country over the next 50 years that they were still not up to the task of defending the borders, let alone catapulting Macedonia onto the world stage. Philip took Iphikrates' reforms as his model and adapted them to his own needs. He needed to equip himself with an infantry force that could fight competently in hand-to-hand, in a phalanx, and to do so as cheaply as possible since he would have to pay for it personally, rather than his infantrymen, who being essentially peasants, not middle-class city dwellers, could not possibly afford to do so themselves. Iphikrates had pointed the way. The Macedonians were already using a bronze shield before his time, but it was not the aspis of the Greek hoplite, as it was smaller, between 60 and 75 cm in diameter, and lacked the characteristic rim of the Greek aspis - in other words, something of a hybrid between the traditional pelta and the Argive aspis. It was probably introduced by Archelaos, who sometime between 413/2 BC and 400/399 BC according to Thukidydes (2.100) "reorganised the cavalry, the arming of the infantry, and equipment in general", and the first depictions of it indeed come from circa 400 BC.29 It may have been adapted from the neighbouring Illyrians. The southern Illyrians bordering Macedonia used round shields that are extremely similar to those used by the Macedonians. The Illyrian plate from Gradiste, dating from the 5th or 4th century, shows such shields being used by warriors both on foot and horseback (Fig. 1). Fig. 1. Illyrian warriors, ca. 400 BC. 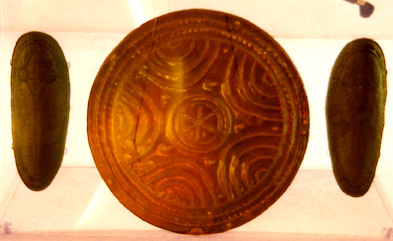 We have no way of knowing that the shields depicted on this plate were bronze-faced like the Macedonian shield was, but an earlier Illyrian shield, depicted on a 6th-century BC plate from the Liburni complex at Nin shows a different style of round shield, one with concentric rings for decoration.30. This might imply a different sort of construction for these earlier shields than those depicted in the later Gradiste plate, and they may be related to the shields born by the Thracians shown in the similarly early Persian reliefs at Persepolis which look quite different from the 'typical' Thracian pelta. 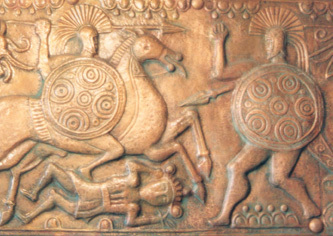 A fine example of a bronze shield that is apparently of Illyrian origin is preserved in the Tirana museum (Fig. 2). It is of very modest size, being apparently less than 50cm in diameter. Unfortunately, I can neither confirm its origin (its small size might weigh against it being Epeirot, the other likely possibility), nor its date. While the Gradiste shields might well be called aspides, this shield is more clearly a pelta; inevitably there is some overlap of the two terms. Philip's brutally efficient training programme, backed by his autocratic royal power, ensured his men lived up to his expectations. Training men to use two sorts of weapons with equal facility is no easy task, and very few other classes of warriors over the millenia have ever attained such dexterity; the few that readily spring to mind are mostly aristocratic steppe horsemen accustomed to both lance and bow. Training his men to use two weapons that required a completely different formation to fight with, a rigid pike phalanx against the loose order required to hurl javelins, made the achievment all the more outstanding, especially given the inclusive nature of his reforms - it was the entire national levy that was so trained, and not just a picked elite. The result was that not only could Philip eventually come to count on troops as good as any opposition could field, but he would have numbers of his side as well. This then was the force that Alexander inherited from his father for the conquest of Persia. The evolution of the Macedonian infantry proceeded under Alexander. As already noted, the phalanx had acquired body armour by the seige of Tyre at the very latest, possibly non-metallic, as it was burnt when it was replaced with elaborately decorated cuirasses while in India.37 Expansion of the army entailed reorganisational changes,38 and at his death, Alexander was experimenting with a radically new type of phalanx, incorporating javelinmen and archers in its rear ranks, but it was never used in action. Upon his death, his generals carved his empire up amongst themselves. Quality troops were at a premium, and no-one could afford to dilute the effectiveness of their most valuable units with such Persian missile troops. The struggles of the Diadochoi, the Successors, however set off a new round in the evolution of Hellenistic infantry which I will describe in part 2 of this article. I would like to thank Duncan Head for so many useful discussions. Thanks also to Michael Anastasiadas for taking the photographs used in this article of objects displayed in the museum at Tirana in Albania, and to John Edmundson for looking up references to Illyrian equipment. Finally, David Karunanithy went well beyond the call of duty in me sending copies of many of the articles mentioned in the footnotes. Return to my wargaming index.